This perfect combi boiler provides unrivalled quantities of hot water and enough heat to make all the rooms in your home cosy and snug. All this plus greater energy efficiency and an attractive price tag! If these criteria are near the top of your wish list, then our high-efficiency, Combi Compact HR combi boilers are the obvious choice. You can choose from one of four models, varying in power output and hot water capacity from the ultra-compact Combi Compact HR 22 to the ultra-efficient HR 36/30. Regardless of the model, they all have several benefits in common – high comfort, low energy consumption, minimal emissions and an attractive price tag. That’s what we call high efficiency! High-efficiency boilers have been around for years. But it was Intergas who brought out the first double-HE boiler, i.e. 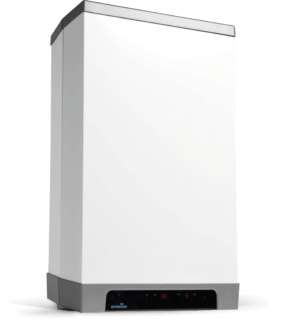 high-efficiency heating and hot water. Naturally, we use this innovative, energy-saving technology in our Combi Compact HR. And it’s all possible thanks to our aluminium heat exchanger with segregated copper loops. These elevate hot water energy performance levels to HE status. The Dutch Consumers’ Association has awarded this reliable, tried-and-tested technology its ‘Best Buy’ award on numerous occasions.